Rev. 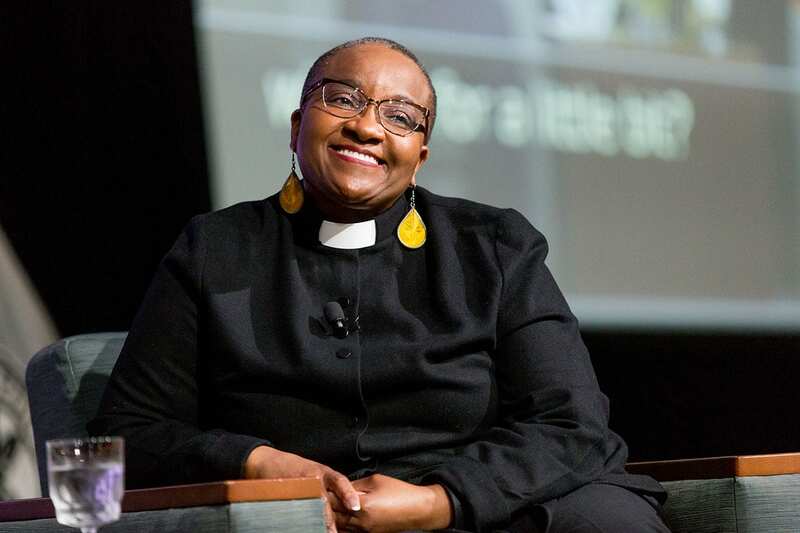 Nontombi Naomi Tutu, a human rights activist and the daughter of South African anti-apartheid leader Archbishop Desmond Tutu, spoke about the importance of individual actions in building a beloved community during the second annual Rev. 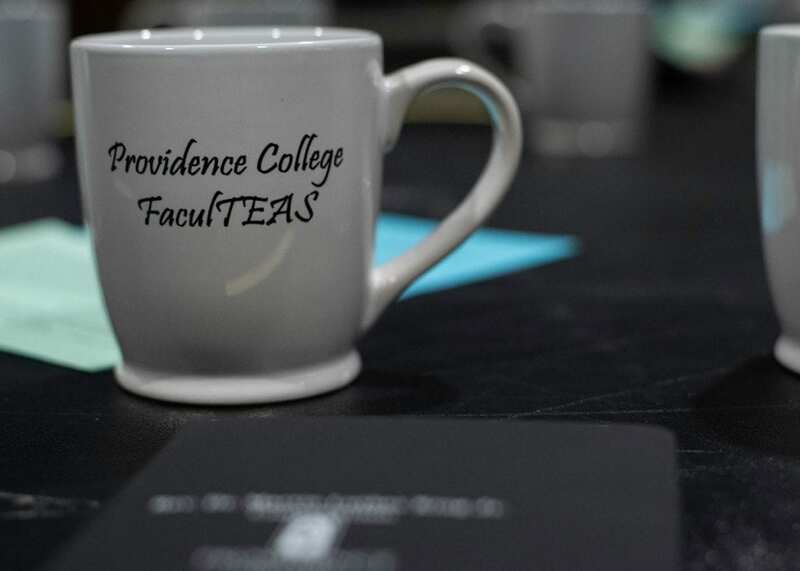 Dr. Martin Luther King Jr. Convocation at Providence College on Thursday, Jan. 24. Rev. 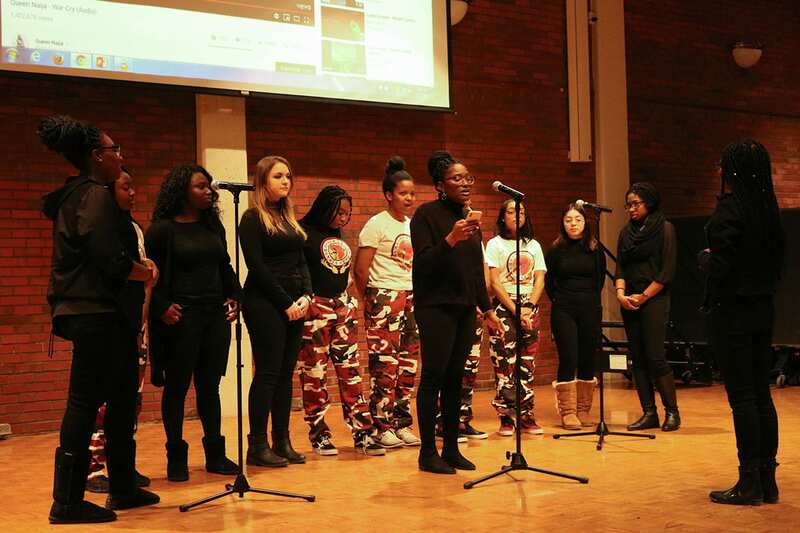 Tutu was the featured speaker during the College’s second annual Rev. 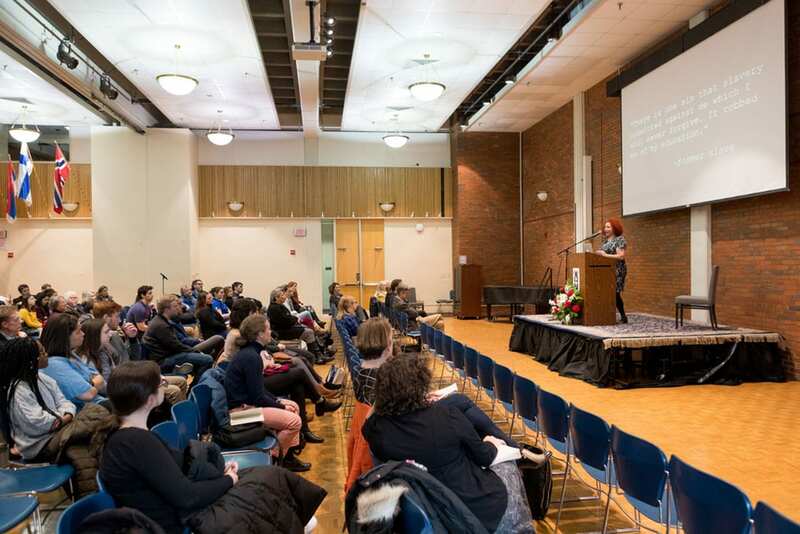 Dr. Martin Luther King Jr. Convocation Week, which featured programs to advance Dr. King’s vision of a “beloved community.” In 2018, the College hosted Rev. Bernice A. King, the daughter of Rev. King and director of the Martin Luther King Jr. Center for Nonviolent Social Change. Rev. Nontombi Naomi Tutu, who presented the keynote address at the College’s second Rev. Dr. Martin Luther King Jr. Convocation, is an ordained Episcopal priest and human rights activist. 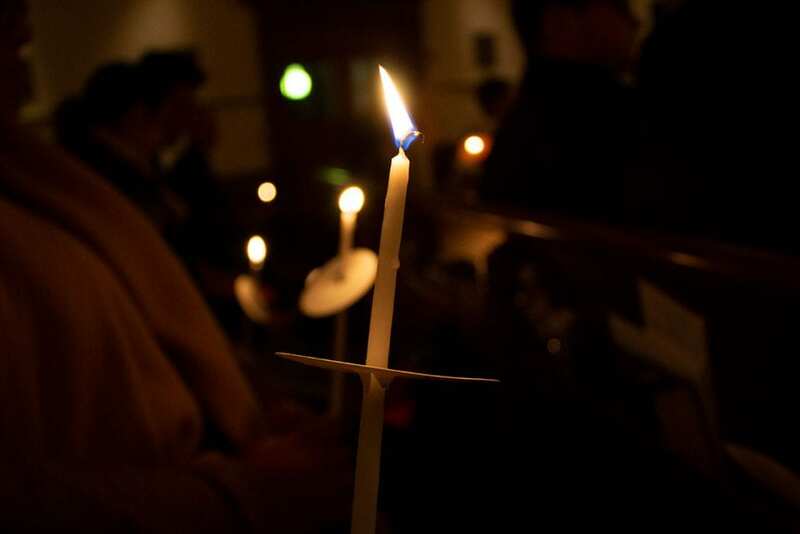 This year’s events included a candlelight vigil in St. Dominic Chapel, a student celebration in Slavin Center ’64 Hall, and a discussion with Dr. Comfort Ateh, associate professor of education, and Maco L. Fanieul, a member of the adjunct faculty in black studies. 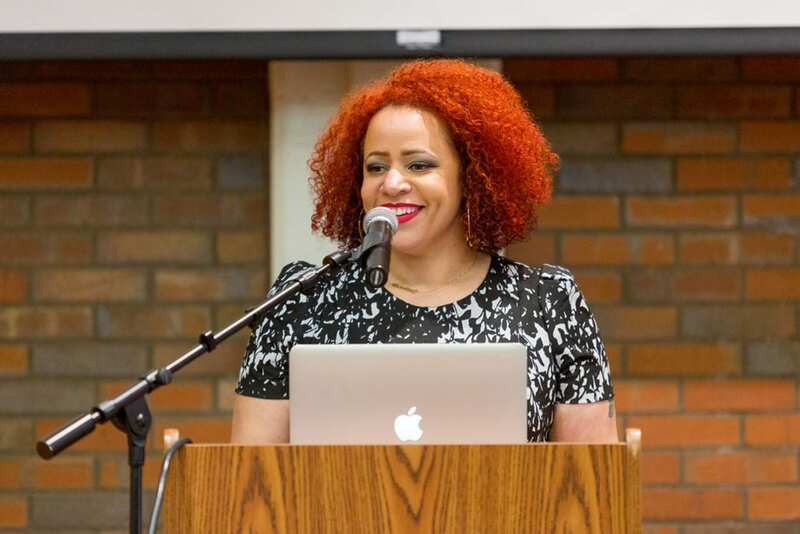 Nikole Hannah-Jones, a writer for The New York Times Magazine, also spoke about racial segregation in American society as part of The Humanities Forum. About 650 people attended Rev. Tutu’s presentation in the Peterson Recreation Center. College President Rev. Brian J. Shanley, O.P. ’80 noted that the convocation was taking place during a day of torrential rain and sweeping wind that felt “biblical,” which was fitting because both Archbishop Tutu and Dr. King were men of faith, trained as theologians. 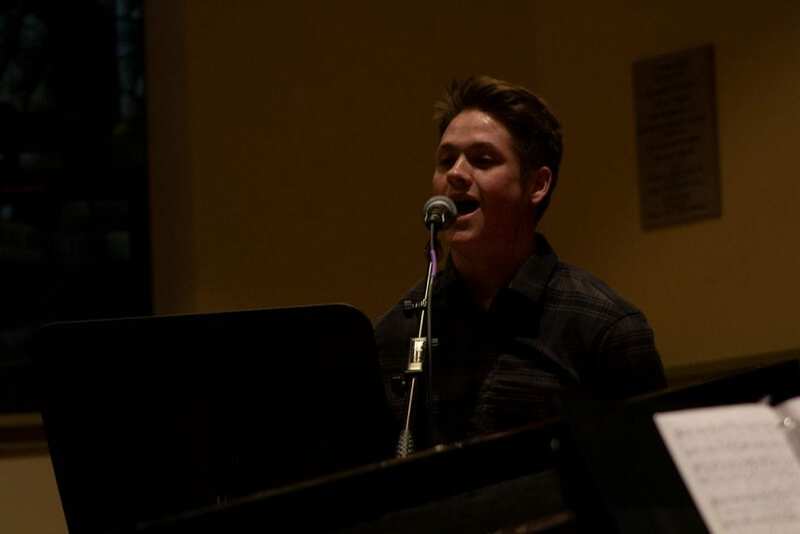 Both men believed that through the solidarity of the human family, “we are all responsible for each other as brothers and sisters,” Father Shanley said. “They believed that the poor and the marginalized have a privileged claim upon the consciences of believers and the resources of the state. Finally, they believed that racial reconciliation is a divine gift and a divine promise, only partially realized in our community, and trusting in its fulfillment in God’s good time. 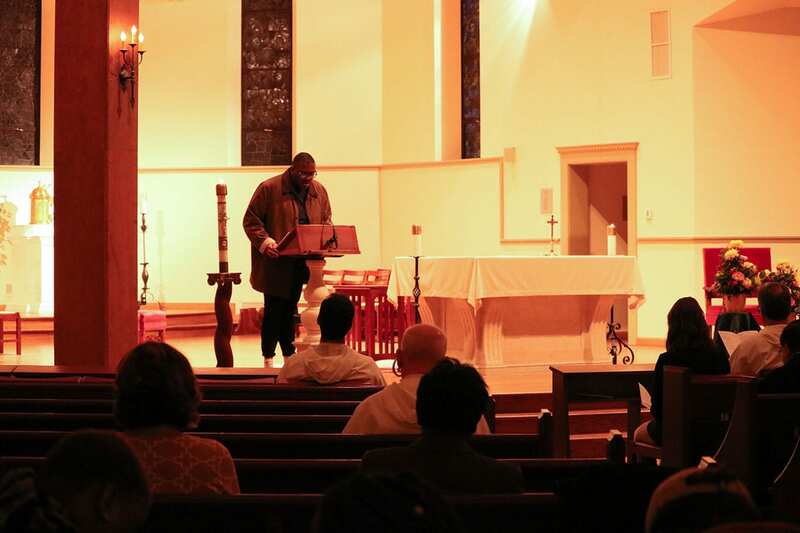 “These central theological truths animate the work that Dr. King did and that Desmond Tutu did, and they should be values that we can embrace on our campus in our own efforts to turn this campus, which is not yet, into a true beloved community,” Father Shanley said. Jillian Rose ’04, director of community engagement, diversity, and research at the Hospital for Special Surgery in New York City, receives the MLK Vision Award for her advocacy for marginalized patients. College President Rev. Brian J. Shanley, O.P. ’80 prepares to present her the award. 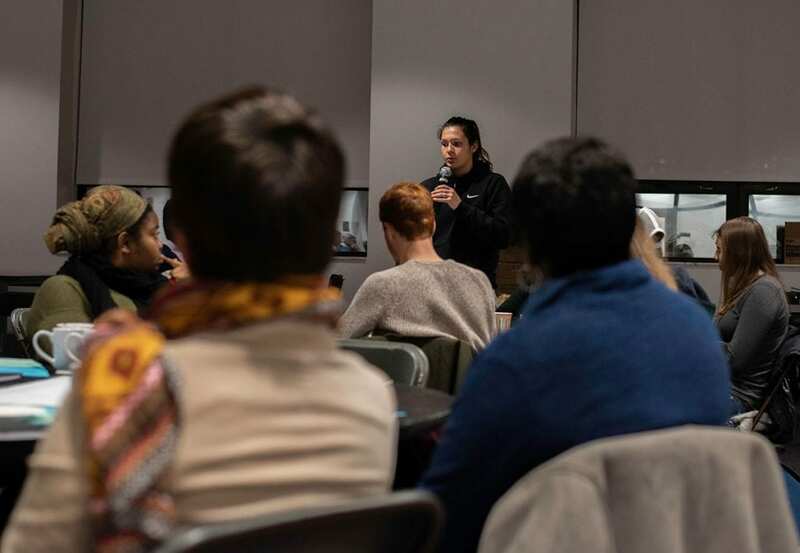 The week’s events were planned by the College’s MLK Convocation Committee, which was chaired by Ralph E. Tavares ’01, director of multicultural student success and assistant dean of undergraduate students. 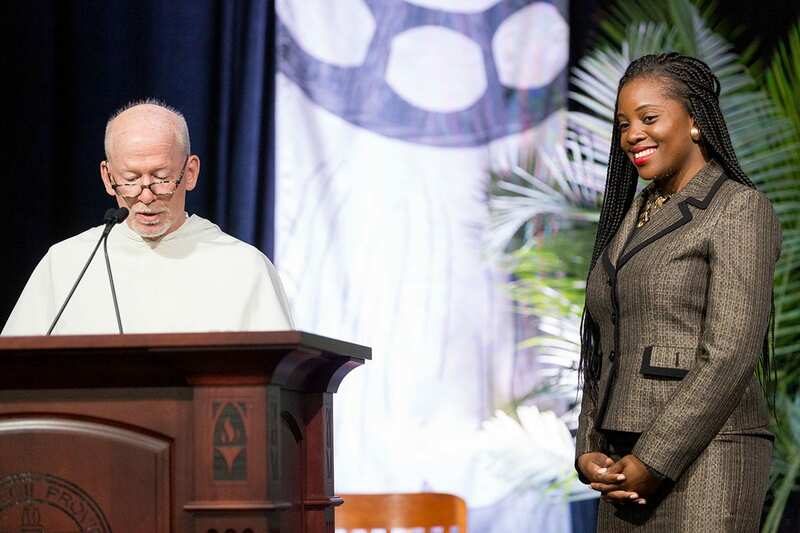 As part of the convocation, Tavares announced the presentation of the Martin Luther King Jr. Vision Award to Jillian Rose ’04, director of community engagement, diversity, and research at the Hospital for Special Surgery in New York City. Rose majored in social work and in health policy and management at PC and earned advanced degrees from George Washington University and Columbia University. Her advocacy on behalf of marginalized patients was recognized with the Distinguished Educator Award from the Association of Rheumatology Health Professionals in 2018. Rev. Tutu was introduced by Marvin Taveras ’19 (Lynn, Mass. ), a public and community service studies major. 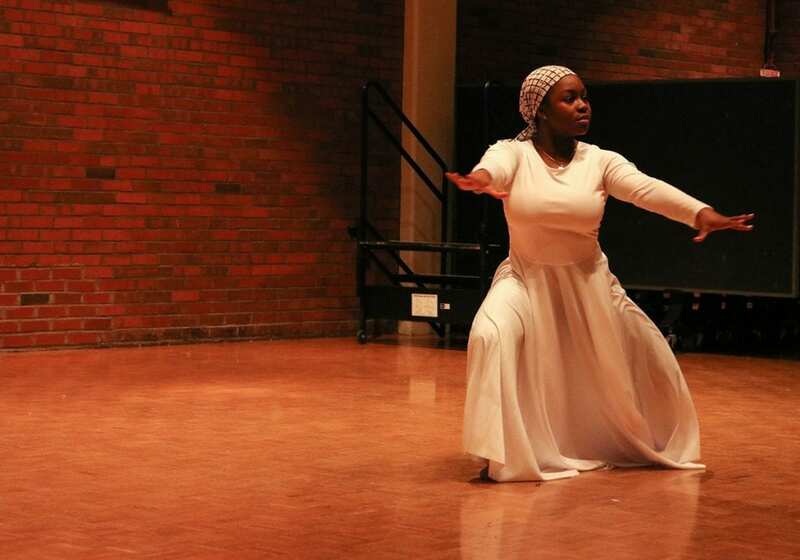 Tavares is president of the Organization of Latin American Students, PC’s chapter of NAACP, and the STEP team, and a member of the Board of Multicultural Student Affairs and the Motherland Dance Team. He has undertaken five independent studies and co-taught courses in dialogue, communication, facilitation, and community engagement. 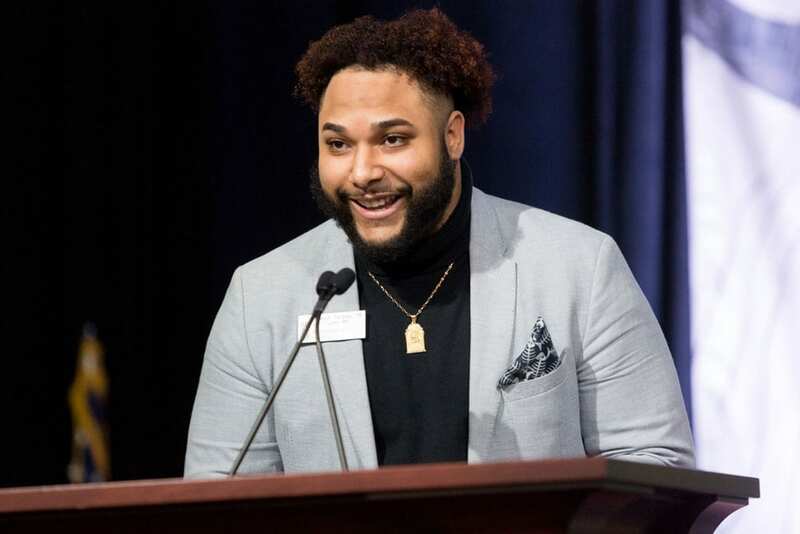 Taveras, a Martin Luther King Jr. scholar, said he has realized through his studies “what it means to be a leader and how I can leave my mark here at Providence College and beyond.” He challenged students to share what they learned during the convocation week with someone who did not attend. 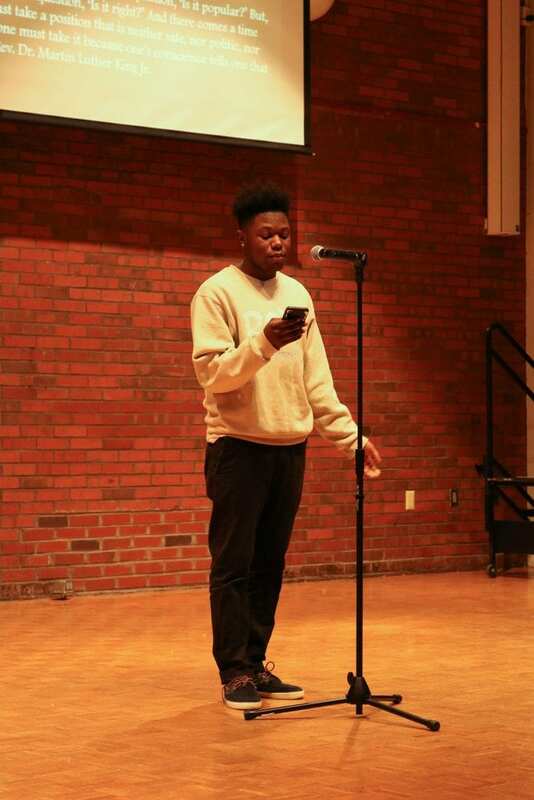 Marvin Taveras ’19, a student leader who is president of the Organization of Latin American Students, PC’s chapter of NAACP, and the STEP team, introduced Rev. Tutu. Rev. Tutu grew up in racially segregated South Africa, as did Trevor Noah, author of Born a Crime, the Common Reading selection for the College community for the 2018-19 academic year. Rev. Tutu was the fourth child and third daughter born to Archbishop Tutu and his wife, Leah Nomalizo Tutu. She was educated in Swaziland and England, earned a bachelor’s degree in economics and French from Berea College in Kansas and a master’s degree in international economic development from the University of Kentucky, and has studied toward a doctorate at the London School of Economics. Rev. Tutu said she believes courageous leaders show their true characters at times when no one is watching them. “When we say we are on the road to a beloved community, there is something that is called for from us every day in our lives,” Rev. Tutu said. “Every day we are being asked to make choices that maybe nobody else notices, but we know that we are being asked to make.” It is a challenging journey, she added. Once, on a trip home to South Africa, she was stopped at a roadblock. As the young soldier searched her rental car, she saw fear on his face, and so made the decision to begin an ordinary conversation with him. “Sometimes that is all that the courage to change is — to stop for five minutes, for 10 minutes, for half an hour, for an afternoon, for a day, for a week, for a month, to stop the tape that we have in our heads that tells us what we know about the other,” Rev. Tutu said. Rev. Nontombi Naomi Tutu discussed growing up in South Africa as the daughter of Noble Peace Prize winner Archbishop Desmond Tutu. Rev. Tutu said some of her biggest heroes are the white South Africans who had the courage to reconsider what they had been taught about the role of black people in their country. One is Rev. Beyers Naudé, who became an outspoken opponent of apartheid after talking with South African refugees while studying in the Netherlands. They were the first black people he met who were not his parents’ servants or gardeners, or the custodians of his church, she said. 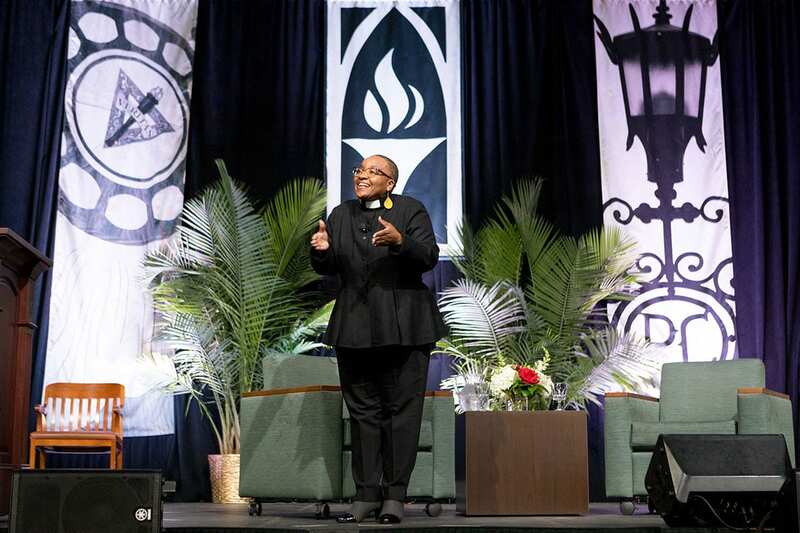 “When we have the courage to question all the things that we think we know, we open the door a little bit for ourselves to experience a taste of the beloved community,” Rev. Tutu said. When Nelson Mandela was imprisoned on Robben Island, his guards were told to steel themselves for an encounter with evil. Instead, they met a man “who was steeped in his own dignity as a human being, who completely refused to be demeaned or diminished,” and who refused to demean or diminish them, Tutu said. He asked about their families, their dreams and aspirations, and helped one secure a college scholarship for his son. “He gave those guards the courage to ask questions” about what they had been told, Tutu said. Archbishop Tutu, who was awarded the Nobel Peace Prize in 1984 and chosen by Mandela to head South Africa’s Truth and Reconciliation Commission, never stopped trying to get the South African government to negotiate with black leaders, Rev. Tutu said. It might be easier to pretend you don’t hear when friends or family say things that are hateful, Rev. Tutu said. 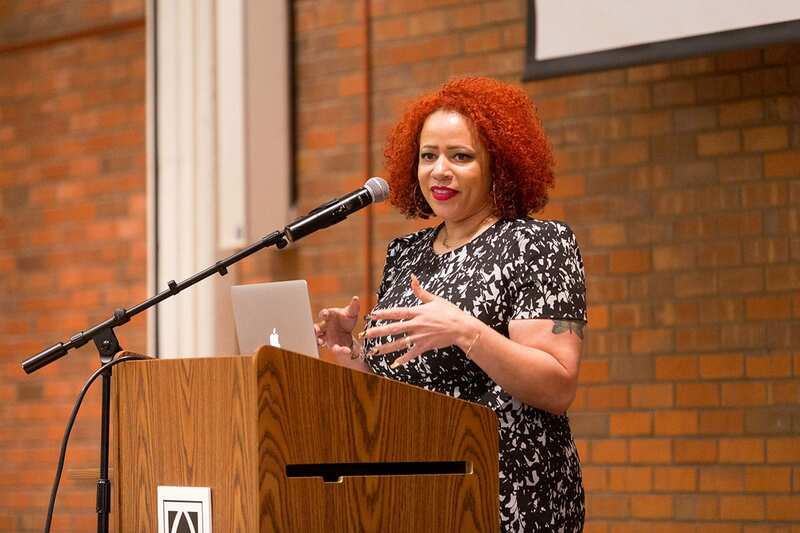 As part of MLK Convocation Week, Nikole Hannah-Jones, a writer for The New York Times Magazine, spoke at The Humanities Forum about continuing segregation in education.